Review : Peppa Pig's Surprise! Last weekend we took the girls to see Peppa Pig's Surprise. E will watch Peppa Pig, although it won't be her first choice anymore but T is simply obsessed. Its amazing how at such an early age they get fixed with something. Anywhere we go, she can spot anything with Peppa Pig on it from a distance. So when my husband saw tickets for the show at our local theatre, he snapped them up. We were sat in the second row and combined with the booster seats for the girls, this was the perfect spot to see the show. I've never seen (or heard!) so many over-excited toddlers and pre-schoolers! 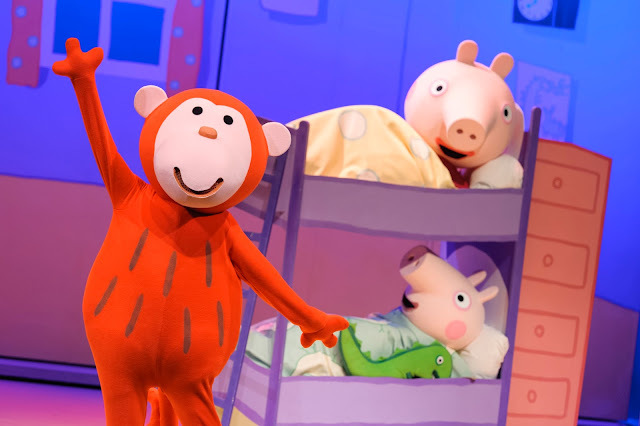 Without spoiling the story, the show is about Peppa and her family (obviously!) and a surprise trip to the beach and much of the story ties together with their friend Daisy. Other than Daisy, the characters are large puppets controlled and voiced by cast members dressed in black outfits. 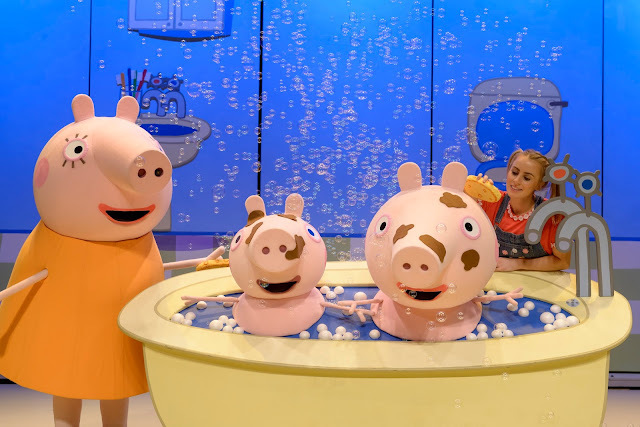 Mummy and Daddy Pig are life sized characters played by the cast members. Being so close to the stage meant we could see the cast members expressions and all the movements clearly. I thought I might find that a little off putting but it really isn't - not that the show required my concentration! With T not quite 2, I wasn't entirely sure how much she would enjoy it and sit still for but luckily, she was engrossed right from the start, shouting Peppa and getting excited. We were really surprised at just how much E got into it - joining in with the singing and fits of laughter. She found it hysterical when some of the audience (including us!) got wet and has mentioned it several times since! At the end of the show all the children in the audience were dancing along in the rows and their seats which was really lovely to see. The show lasted about an hour and it was only in the last 15-20 minutes that T really started to struggle with sitting still and concentrating - it didn't help that the theatre was incredibly hot. That said, I'm pleased we got tickets and were able to tell them as they both enjoyed it. 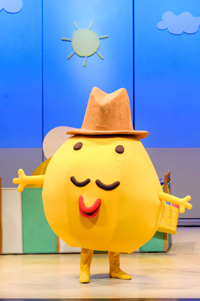 If your children are Peppa Pig fans I would absolutely recommend you take them as they will love the show. NB - We paid for our own tickets to see the show. Unfortunately, although understandable, the ushers were very quick to stop anyone using any mobile phones or cameras so I was unable to take any of my own pictures. Photo credit (with permission) - Dan Tsantilis from Peppa Pig's Surprise! tour 2015 and 2016 via the show's official website.